Portfolio for Jira provides you with full flexibility when configuring the availability of team members. You can see which member is available to work, on which team, and for how long. Before you begin, make sure that you have the shared team management permission in Portfolio for Jira. Go to Portfolio (in header) > Manage Shared Teams. This will display the Shared teams and people page. Click the Teams tab. This will display the teams that are shared across plans. Expand the team you're looking for. This will display the members of that team, and the weekly hours allocated to each member. Go to your plan > click the Teams tab > click the person whose global availability you want to view. Note that you can also configure global availability directly from here. Go to the shared team you want to view. Click the member whose global availability you want to configure. The availability details will display. You can configure the dates and working hours that team members are available to work on specific teams. 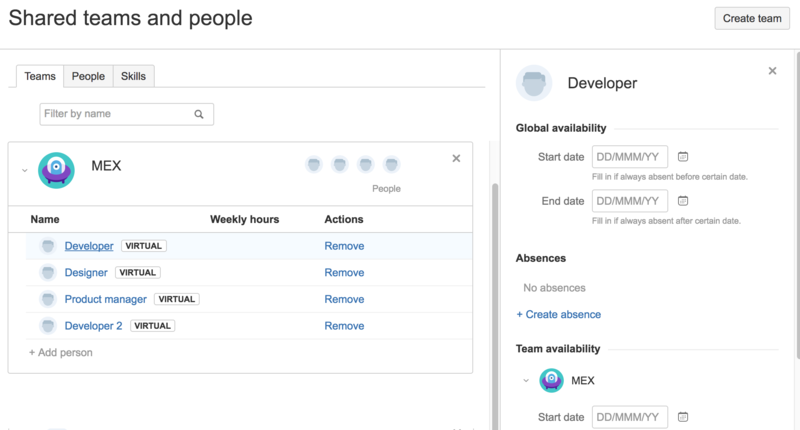 When configuring the availability of a team member who belongs to multiple teams, you will see these teams in the Team-specific availability section. Expand each team to configure the dates and hours that the member is available to work for each team respectively. When configuring the availability of a member of a shared team, you will see the shared teams that the person belongs to in the Shared teams and people page. Click the Teams tab to display the teams section below the timeline. This will display the teams associated with the plan. Expand the team you're looking for. This will display the members of that team. Click the member whose availability you want to configure for that team. You can configure the dates and hours in a week during which a member will not work for a specific team. This is especially handy when you have a person who works in multiple teams. For example, let's say you have a developer who works in Team A and Team B, and during the month of September, the developer needs to prioritize work in Team A for a particular release. By configuring exceptions in Team B, it is then made clear that the developer won't be assigned any work for Team B during that period. Click the member for whom you want to configure exceptions > click + Add exception.